The Highland sporting estate was an important feature of late 19th century life in the hills and glens of northern and western Scotland. 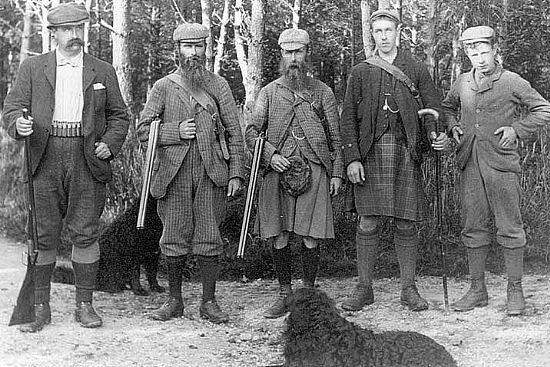 Like the army, sporting estates helped to restore the wearing of the traditional Highland garb following it's legal proscription by the British Government in the wake of the last Jacobite rebellion. The kilt (although different in design and character to the pre-1746 version of Highland dress) was a common sight on sporting estates. Tweed - also a very appropriate cloth for the unpredictable Highland weather - was (and still is) a very common type of clothing on the Highland Estate. Are the two men with beards brothers? The order of rank and authority quite clearly appears to start from the left hand side of the photograph.